Expanding camera technology has allowed us to capture more and more with each technological advancement. Now, new camera technology developed by Australian researchers is shedding light on the deeper parts of the ocean and exactly what lives down in the dark. A creature whose name translates to "headless chicken monster" is the most recent sighting of rarely seen creatures off East Antarctica in Southern Ocean waters. The headless chicken monster, whose scientific name is Enypniastes eximia, is a kind of deep-sea cucumber with the ability to swim because of its wing-like fins. Sea cucumbers are echinoderms, a phylum of invertebrate marine animals that includes starfish and sea urchins. They're generally ocean-floor dwellers and feed on tiny particles like algae. There are about 1,250 known species, someof which are harvested illegally because they're prized as delicacies and folk-medicine ingredients. The headless chicken monster has been seen only one other time, in the Gulf of Mexico, according to Australia's Department of Energy and Conservation. This time, the creature was recorded during a project using cameras to understand the effects of long-line fishing on species that live in deeper parts of the ocean. "The cameras are providing important information about areas of sea floor that can withstand this type of fishing, and sensitive areas that should be avoided," said Dr. Dirk Welsford, program leader for the Australian Antarctic Division. 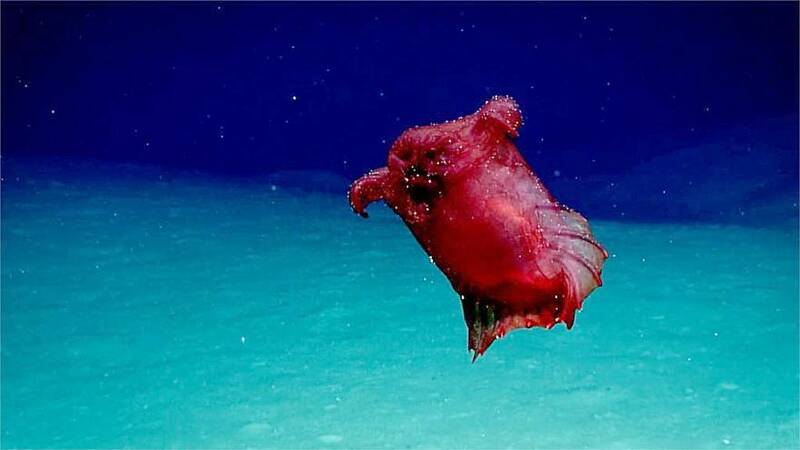 In the video captured by the Australian researchers, the transparent red monster can be seen foraging on the ocean floor with various tentacles, as if it's going for a stroll. It can also be seen swimming upward with its fins, which most sea cucumbers can't do. He elaborated on the special camera, saying, "We needed something that could be thrown from the side of a boat and would continue operating reliably under extreme pressure in the pitch black for long periods of time." Data collected from the cameras were presented Monday at an annual meeting of the Commission for the Conservation of Antarctic Marine Living Resources in Hobart, Australia.